Forward Operating Base Jackson, Sangin, Afghanistan – During the month of June, when the Taliban kicked off the brunt of its fighting against Marines with 1st Battalion, 5th Marines, members of the Shock Trauma Platoon saw casualties every day, it was a busy time when lives were saved and bodies patched up. Things have slowed a bit, which means fewer Marines are being hurt. But for the trauma platoon it means wide valleys of time… they’re on call 24/7 and not permitted to leave the base or perform any duties that would take them away from the aid station. Time passes slowly, but not for Cmdr. 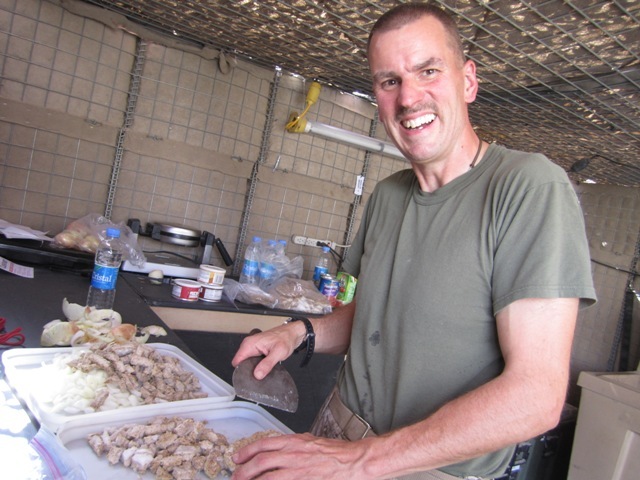 Erik Sergienko who plans and cooks gourmet meals for the team, and members of the 1/5 Battalion Aid Station, to rival the great chefs of the world. He uses fresh ingredients, but meals are made mostly with packaged goods – meats, sauces, olives, raisins, pastas and other items with a shelf life – sent from home. The dinners take time to prepare and are sometimes interrupted by the arrival of a patient, but there is an order to it. Saturday suppers are grilled chicken, salad with homemade dressing, and, if there are eggs, brownies. Using flour from an industrial size sack acquired in town, Sergienko creates dough for pizza on Slice-of-Sangin Wednesdays, and makes fresh-baked bread and rolls. A favorite of Hospitalman Christopher Carson is Sergienko’s Thai chicken on a bed of noodles and fresh lettuce grown in the team’s vegetable garden. Known by the team as “Commander Iron Chef,” Sergienko is an emergency physician assigned to the Shock Trauma Platoon from his current station at Naval Hospital Guam. He’s been known to cook for 30 consecutive days. Meat is purchased locally or acquired from the chow hall, fresh vegetables come from the bazaar in the district center, the condiments are pulled from a well-stocked pantry and the prep work done by corpsmen, nurses and physicians with a combination of pocket knives, surgical bins and domestic kitchen implements, including a set of bright red plastic salad tongs. Sergienko’s kitchen has a donated Cuisinart toaster oven and a Waring Pro waffle maker that is used on Sunday mornings; there are potholders, dish towels, pots, pans, baking sheets and sponges for clean up. He prepares the meals in a canopied outdoor kitchen with a seating area that could loosely be called their “great room,” a space also designated as a triage area in case of a mass casualty. His spacious plywood countertops have been covered neatly, though somewhat grimly, with sheets cut to size from their supply of heavy black vinyl body bags. Vegetables are cooked on an open fire in a large, shallow pan they found in the burn pit, an item used by the locals to wash their clothing in the river, and meat is grilled on the open half of a 55-gallon drum with wood or charcoal. Cmdr. Mark Duncan at the grill. Toward late afternoon, familiar faces from around the camp – Marines, the chaplain, a handful of battalion staff officers, the corpsmen who are on hand and the medical officers – begin showing up. Battalion commander Lt. Col. Tom Savage made an appearance in June for the 113th birthday of the U.S. Navy Corpsmen rating and gave a short speech. The battalion aid station staff and members of the trauma platoon still spend their days waiting, ready to make a difference in a wounded Marine’s life. But having Sergienko there to sweeten the dinner hour is a bright spot, and luck of the draw. Thanks for the uplifting report that is interesting! 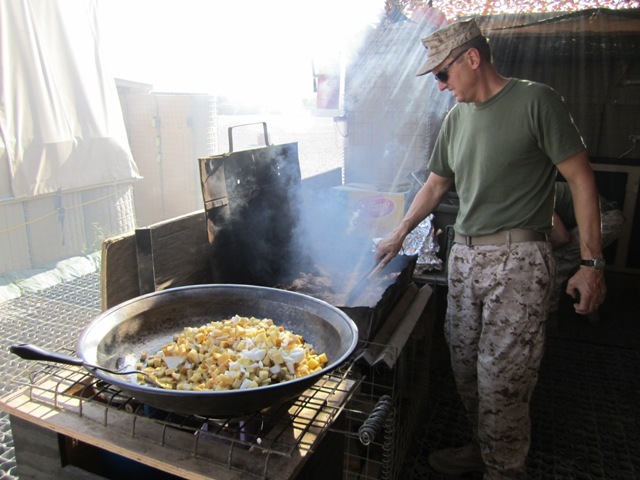 This doc must give a morale boost to those around him…it’s nice having someone around who cares for our wounded kids and offers up some homestyle cooking…healthy for the body and soul! We are very thankful that fewer Marines are being hurt…may the Lord protect each of you 1/5 Marines. Being an amateur cook and fanatic foodie myself…I understand the emotional uplift a good meal can provide a person….this doubles in its positive effects in a war zone…Bless this man, those who partake of his cuisine..and all our men and women in the beloved corps! He’s also a great husband and dad! My daughter is a lucky woman. I’m sure he appreciates all the “care packages” he receives from his family and friends. And the blessing of the prayers said on his behalf. All of us at the STP really appreciate what he does for us. Really brings some of home to Afghanistan. How can we find out how to send him supplies for more meals? Great articles. Met you and your partner when we flew into Jackson. Look forward to reading more of your journeys. Was hoping you two made it up the road during your stay. @Cyd: I’ll try to find out if he’s okay with sharing his address. @Cyd: Sorry the address is not available. Hey, My partner and i come to your blog site coming from search engines like google. It sounds as if you may spend time to jog your site as well as the information and facts an individual provide is actually useful. Last night I personally had written articles which has a similar viewpoint with all your posting; if you value, you can check them on your own. Hope you will probably touch upon the report likewise.